This week on the Edge: Maker Faire video starring you! Texas Women of Influence, San Antonio Book Festival and Census reports booming growth. The San Antonio area added more than 51,000 people from 2014 to 2015, one of the largest gains in the country, according to a new report from the U.S. Census Bureau. Combined with Austin’s gain of 57,000 people, Houston’s gain of 159,000 people and the Dallas-Fort Worth area’s gain of 145,000 people, it adds up to 400,000 people. That’s more population growth than any state in the country, except, of course Texas, which grew by 490,000 people. Thanks to growth from everywhere, even in little Loving County which grew by 28.7 percent. Click here for more on the story, including where all those people came from! In Celebration of Women’s History Month, a group of San Antonio leaders gathered for a conversation about their careers and the challenges they faced as professional women. This year’s Texas Women of Influence panel included San Antonio Mayor Ivy Taylor, City Manager Sheryl Sculley, VIA Chair and former Texas Secretary of State Hope Andrade; Texas A&M University-San Antonio President Cynthia Teniente-Matson, and Terri Williams, Contracting Resource Center Director, UTSA Institute for Economic Development Small Business Development Center. Texas Public Radio’s Eileen Pace moderated the conversation. 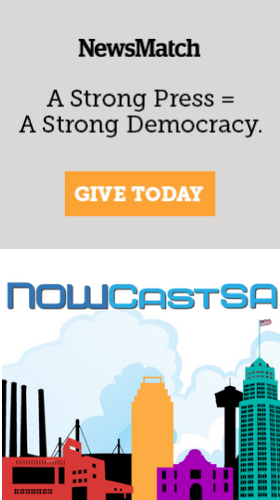 NOWCastSA webcast the panel discussion as we have for the past two years so you can go back and replay the video here to get valuable insight and wisdom from these impressive women. At the 2016 Maker Faire at San Antonio’s Central Library, you helped us make a movie about why San Antonio is a great place to live and how it could be even better. Click here to check out the video and please share the movie and the love with your friends. More than 80 books will come to life this weekend at the San Antonio Book Festival, which is free and open to the public on April 2, 2016. Dozens of authors will be at Central Library or across the street at the Southwest School of Art. They’ll be talking about their books and taking questions from the audience about their work. Click here for a link to the Book Festival’s website and schedule of events, also to a cool new feature: a YouTube playlist with videos of some of the Book Festival authors. Many of the videos are teasers or "book trailers," while others are videos of authors discussing their work. You can go back and replay them even after the Book Festival to decide what to read next!